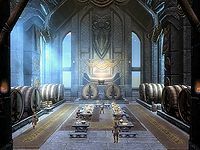 The Hall of Valor is a massive stone mead hall located in Sovngarde in which Nord heroes are welcomed to be forever honored by Shor. 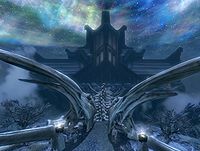 The hall can only be accessed by crossing the huge Whale Bone bridge which is guarded by Tsun, the shield-thane of Shor. 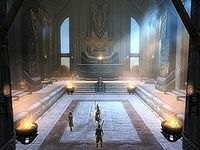 The hall can only be entered by defeating him in a challenge or unless granted permission from Shor (who is not then present; his throne sits empty inside). 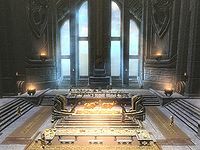 The hall is the gathering place of the heroes who plot to defeat Alduin and his reign of terror in Sovngarde. Beside these famous heroes Hall of Valor walk the honored souls of Heroes of Sovngarde whose names are lost in ages. The exterior of the huge mead hall is Sovngarde. The whalebone bridge leading to the paved terrace is guarded by Tsun, the shield-thane of Shor. You will be required to battle him to prove your worth and be granted access to the hall. If you try crossing without access you will be killed by lightning strikes on the bridge. If you fall into the chasm you will automatically die. Although the interior of the Hall consists of one zone, it can be visually divided into three areas by their general use. Upon entering you will be in the central area with a huge chamber on either side. 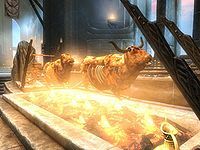 Throughout the hall are many Heroes of Sovngarde, and several important people from Skyrim's history. When you first enter Ysgramor will approach and greet you, advising that three have awaited your arrival to aid you in the battle with Alduin. It is the three you saw defeat Alduin with the Elder Scroll through the time wound; Gormlaith Golden-Hilt, Hakon One-Eye, and Felldir the Old. The central area is mainly for feasting. It is sunken with stairs leading down on each side. It has a huge fire pit in the center, with two whole oxen turning on a spit over it and a drum on the floor to the left. There is a long table on the near side and another on the far side of the fire pit on a raised section in front of Shor's empty throne, both are laid with golden plates, platters and goblets. The food and drink that is found throughout the hall is listed below. There are many small empty barrels around the walls and a couple of larger mead barrels. Some of the heroes prefer this part of the Hall possibly because this is the favorite spot of the Hero Bard who mainly plays the lute and flute. The west wing is a vast bare chamber reserved for sparring matches. Heroes who belong to the Sovngarde Sparring Faction come here to quench their thirst for battle, puzzled about Shor's forbiddance to engage Alduin in combat. There are raised sections against the north and south walls for spectators to watch the matches seated at tables or on rows of benches. There are stairs to the west to access the raised sections and two huge mead barrels against the west wall. The east wing is also for feasting, with enormous kegs of mead against the walls and two small tables and a horseshoe of longer tables in the center. All of the tables are laid with more golden crockery. Heroes come here to enjoy food and drinks as well as the mastery of the Hero Drummer who prefers this hall for his performances. ‡ Only available here and not classed as food, they will be found under miscellaneous items. None of the golden crockery can be taken. If you exit dialogue with Tsun and try to cross the bridge to the Hall, you will be killed by lightning strikes. After slaying Alduin, the Hall will be locked and you cannot re-enter. Inside the Hall you are unable to sneak, wait or draw or equip your weapon. You may not be able to interact with one of the bottles of wine and a sweet roll on a bench. ? This page was last modified on 6 April 2017, at 20:14.